The proper routing of water is crucial to the well-being of the home and foundation. Costs of installing gutters and downspouts are minimal compared with what it could cost to correct an affected foundation or other areas that are subject to improper water flow. Noting that such areas can be expensive and difficult to fix. Gutter Installers - normally with two installers required, at minimum (to deal with longer runs) most contractors install higher-end seemless gutters from coil stock that are less likely to seep, with estimates running between $7 and $14 a lineal foot for 5" to 6" aluminum. Attaching with gutter spikes/ferrules are the most economical method while strap hangars & fascia brackets cost more. Depending on location, there can be much competitive bidding as this is a popular offering that is the norm applied to most new homes. Other options like copper can exceed $20 a foot, depending on prevailing copper prices. Wood gutters near $15 a foot. Styles, sizes & hanging heights will also factor throughout. Do It Yourself Gutters - probably the most realistic gutter hanging for the DIY'er are vinyl gutters, available at home centers. These are easy to cut and the raw vinyl gutter itself goes for about $0.40 per foot, sold in 10 foot sections. Also needed for the install are pieces like joiners, end caps, and gutter outlets along with downspouts and elbows - altogether amounting near $1.25 to $1.50 per lineal foot on a single story home. Adding more for taller downspouts on second story homes. Aluminum can also be worked with, not as easily though due to the difficlty in cutting that may require snips (such as aircraft snips). AL will cost approximately 20% to 40% more than vinyl. Galvanized gutters are similar to aluminum but these should normally be hanged prepainted - unfinished galvanized, at least, has a tendency to resist painting applied oniste due to its oily surface. Gutter helmets and screens will be extra and these can possibly reduce the expense and frequencies of future cleanings. 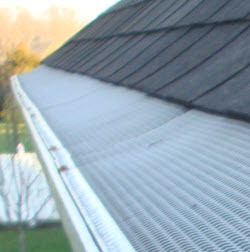 Removing and disposing of existing gutters, normally costs $75 on up. Typically which is present among the quotation. Establishing the ground level to a recommended slope, so that water is able to drain away, will add to the bill. Drip edge will be additional and is usually, though not always, done while re-roofing. Any deterioated fascia and wood pieces should be replaced prior to the installing of new gutters.